After an initial degree in the field of science, Rozanne Anderson received a BFA in Painting from the University of Akron in 1993. She continued with independent study in printmaking and sculpture through 1994, and studied etching and lithography at Kent State University from 1994-1995. Rozanne has always liked the challenge of working in different media. 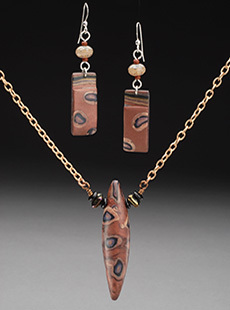 She began experimenting with jewelry making in 2000 and discovered polymer clay in 2006. This modern medium, available in a full palette of color, has challenged her to utilize her painting, printmaking and three-dimensional skills.